S M Ong: Happy holidaze, Singapore! Thursday was Deepavali. I wish all my Hindu readers a belated Happy Deepavali. And if you took leave on Friday (plus Saturday if you're one of those who still work Saturdays), I wish you a Happy Extra Long Weekend. 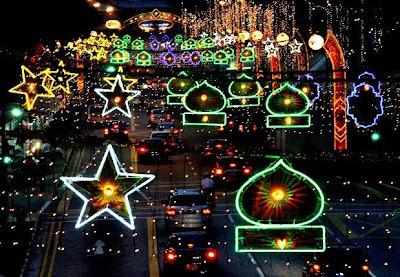 The myriad of holidays we have in Singapore used to fascinate me as a kid. I would memorise the date of every public holiday in the year. But as I grew older, I couldn't keep track. There was at least one occasion when I showed up for work at an empty office and realised I was the only one there because it was a public holiday. I was wondering why traffic was so light that morning. Only Labour Day, National Day, Christmas and New Year's Day are fixed. I especially like New Year's Day because the name of the holiday itself helps to remind me what date it falls on - the first day of the new year. It's that easy. I also have a soft spot for Good Friday because even though the date may change, I always know what day of the week it's on. Sometimes I wish we could be more like the Americans because not only do they have a robust two-party political system, promiscuous women and 'Weird Al' Yankovic, they also have public holidays that don't fall on fixed dates but are easier to figure out for the layman. For example, the most important holiday for Americans besides Christmas is Thanksgiving, which doesn't have a fixed date, but it's always in November and it's always the fourth Thursday of the month. Memorial Day is always the last Monday of May. Labor Day is always the first Monday in September. Martin Luther King Jr's Birthday is the third Monday of January, which is a bit strange because how can someone's birthday not be a fixed date? When I first heard about these holidays when I lived in the US, I was completely taken by this what-weekday-of-the-month system because it actually made sense (except for MLK Jr's Birthday). If we had something like this in Singapore, no one would ever have to suffer the indignity of showing up for work on a public holiday again. OK, when I say 'no one', I mean me. By the way, I also like to wish all my American readers a Happy Thanksgiving on Nov 25. You see? Even I know when it is.